At CTIA WIRELESS 2005 held in New Orleans, LA on March, 14, the SD Card Association (SDA) announced plans to finalize specifications for a new, super-compact memory card this Spring. 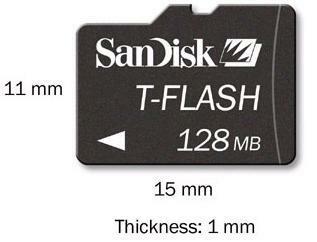 The SanDisk® microSD™ card, expected to be the world's smallest memory card and measuring just 11mm x 15mm x 1mm, will be completely compatible with SanDisk® Corporation's TransFlash™ format. The microSD card offers the advantages of removability and SD compatibility for use with a host of SD- and miniSD™-enabled products. The microSD card is supported by the more than 800 members of the SD Association and can be used immediately in the millions of handsets that currently use TransFlash. SanDisk plans to transition its TransFlash line to the microSD standard in Q3 2005.